Ravine Road is located in arguably the best part of Medford, an enclave situated between Lower Mystic Lake and parks, yet close enough to access the amenities of West Medford Center, the commuter rail and schools, without the use of a car. 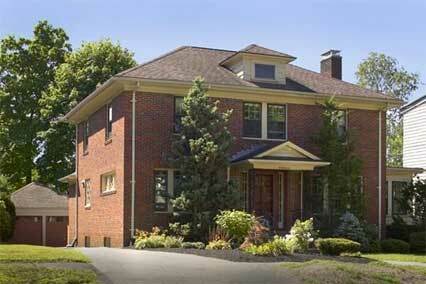 This 7-room, 2.5 bath brick Colonial has been renovated for today’s lifestyle, with its open kitchen and family room. A small mudroom off the kitchen, with closet, is a convenient drop-off point for coats, boots, etc. The living room is handsome, with its wood-burning fireplace, French doors on either side, and warm natural wood to provide the perfect spot for more formal entertaining. With its generous size, the far end easily accommodates a dining room table and chairs, and serving is made easy with the doorway to the kitchen nearby. The French doors lead to a delightful office/flex room with windows all around. On the second floor, two bedrooms were combined to create a master bedroom suite, with solar tube for natural light; built-ins around the bed; a systematized walk-in closet; and full bath with shower stall. The larger of the other two bedrooms has a closet system, too. The basement is great and has a large open area that could be finished for a multitude of uses; there is a closet that would make a fab wine cellar; a newer washer and dryer; an extra refrigerator; and a bulkhead for easy outdoor access. The fenced yard with patio is large and lovely; there is a two-car garage.